I visited the dentist last week, where she found a small cavity in between my upper back molars. She put in a filling and recommended more flossing. “Make sure you get all of the way up to the gum line when you floss,” she told me. Of course, when I got home, I was curious to find out what the evidence says about flossing. The Cochrane Collaboration published a systematic review on flossing in 2012. Their analysis included 12 studies with more than 1,000 participants looking at the effectiveness of flossing on preventing gum disease and tooth decay. The review found that people who brush and floss regularly have less gum disease compared to those who brush alone. There wasn’t enough evidence to determine whether flossing prevented tooth decay because the studies did not follow participants long enough. 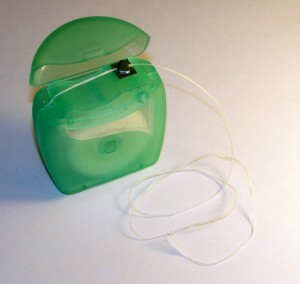 And there was very weak evidence that flossing helped to decrease the amount of plaque on teeth. I am completely surprised that there is such poor-quality evidence on a preventative technique that so many dentists recommend. Personally, I think the evidence shows enough of a benefit that I will continue flossing each evening. But this is certainly an area where researchers should focus in the future.